A Pigeon passing by a metal fence at Albert Hall Museum, Jaipur. First, I composed the Zigzag Fence for the frame. 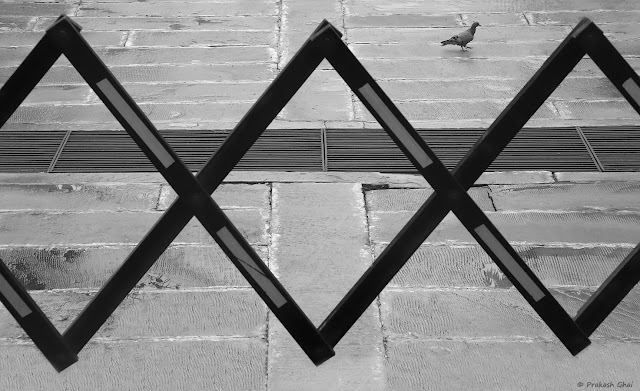 Then I waited for the pigeon to walk into my frame near the "Rule of Thirds" area, in one of the inverted V's made by the fence. During editing, I measured the crop required at both ends of the frame for the fence, to further enhance the symmetrical alignment. As far as the Minimalism Classification goes, this Minimalist Photo falls under the Minimalism as in Small Objects category. The Small Object being the Pigeon (main subject).